They are known by many names (blind drain, land drain, French ditch, sub-soil drain, etc. ), but serve the same essential purpose. French drains are constructed in one of two ways; they either contain a trench that is filled with rock/gravel, or consist of a perforated pipe that juts out of the ground at a designated area. Their role is to divert groundwater away from a specific spot, so as to prevent flooding. As one might imagine, they are typically employed in low lying areas or regions prone to high amounts of rainfall; French drains are used in residential and commercial applications, and require perfect placement and construction. Since the main goal is to keep groundwater from penetrating building foundations, the plumbing contractor must know exactly where to position the ditch and/or protruding pipe for maximum drainage effectiveness. There is little room for error in this respect, which is why using the services of a professionally trained plumber like Brothers is highly recommended. 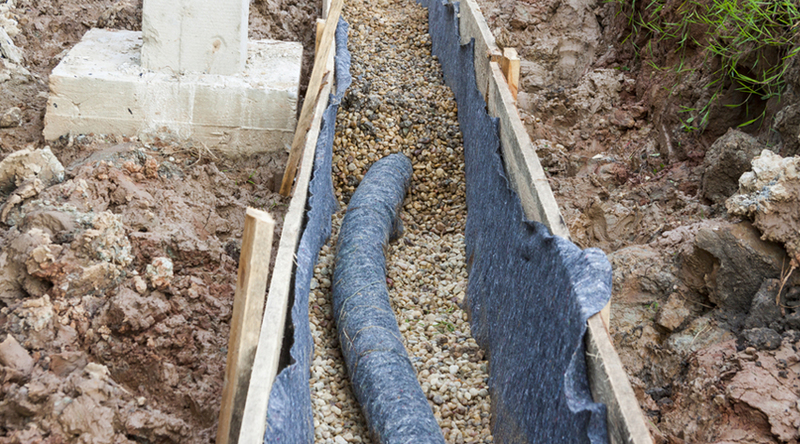 For almost 40 years, we have provided quality French drain construction services to home and business owners throughout the GTA, and employ expertly trained technicians with the knowledge and experience you would expect from a leader in the field. All of our crew members have undergone extensive training and certification, and have worked on and managed hundreds of French drain projects for our residential and commercial customers. Basement leaks and excessively wet landscapes are a sure sign that your property is having drainage problems, ones that should never be avoided for any reason. For all you know, your foundation could be suffering serious issues; given the right circumstances, too much moisture can be downright catastrophic. If all goes well, meaning our crew does not run into any unexpected surprises on-site, Brothers can usually have a French drain construction project completed in a few days at the latest. Some commercial and industrial properties often require multiple drains, especially if we determine the need for more during the initial assessment. With an average cost of between $2,000-11,000, French drains certainly are a sizable investment. However, given what is potentially at stake (like a flooded basement or damaged foundation), the future costs could be much, much higher. This is by no means an ultra budget-friendly project; to avoid the hassle that comes with hiring an inexperienced and unqualified contractor, be sure to contact the experts at Brothers Plumbing as soon as possible. We take our time to make sure every job is completed to perfection, and that our customers are 100% satisfied with the work we do. Licensed, insured, and certified, you get the peace of mind knowing your French drain service and installation needs are being handled by a true professional. "Nancy and I would like to thank Brothers Plumbing for their professional management of a serious drainage problem that suddenly developed at our home." "Hi Cindy, I just wanted to thank your company and especially the three gentlemen who worked on our home: Harold Peter, Ken Fowler and Frederick Jnnoel." "Good afternoon, One of your guys just did a quick repair job at our house and my husband said the guy was great. It didn’t take long, and he felt like he could trust him." "Dear Sirs,About two weeks ago, two of your employees, George Lambrakos and Anatoli Masimov came and installed a new washroom in the basement of our house, and we want you to know how pleased we are..."